Michael Mann is taking a mulligan on the Chicago mafia, this time to tell the story of Tony Accardo and Sam Giancana. Mann has brought screenwriter Sheldon Turner on board to pen "Big Tuna," a film he wnats to direct about the relationship between Accardo and his protege, Giancana, reported Variety. "Public Enemies,'" was Mann's previous foray into the Chicago underworld. Despite a great cast led by Johnny Depp, Marion Cotillard and Christian Bale, it was a crushing bore. Let's hope he gets it right this time. "Big Tuna," (aka "Joe Batters") was one of Accardo's nicknames when he was head of the Chicago mob known as The Outfit. After feeling the heat from the IRS, Accardo anointed Giancana his successor, but it was sort of a Putin-Medvedev arrangement--Giancana could do what he wanted, but had to get an OK from Accardo. George Clooney, Vera Farmiga, Anna Kendrick, and Jason Bateman hit the red carpet to talk about what what attracted them to the project. Ultimately, Accardo grew weary of Giancana's shenanigans, and exiled him to Mexico, where he spent the next six or seven years, before local authorities shipped him back to the states. Upon his return, Giancana turned rat on the mob, and, not surprisingly, was eventually found dead in his basement. Whether it was the mob or the CIA (they had allegedly asked him to find someone to assassinate Fidel Castro as far back as 1960) who whacked Giancana remains unclear, but he definitely pissed off a lot of people. 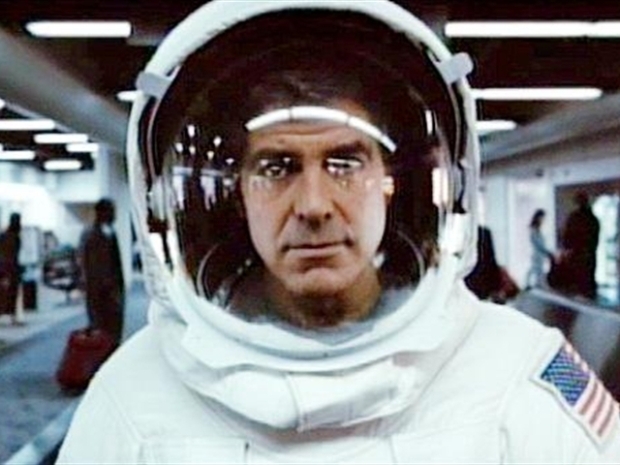 Among the extra scenes included in the new "Up in the Air" DVD that hits stores today is a clip of a baleful George Clooney in a spacesuit, his breathing tubes attached to his beloved wheeled suitcase as he makes his way from the airport to his apartment, while Ricky Nelson's "Lonesome Town" plays. "(C)harts the personal and professional relationship between two friends which involves a betrayal that leads to retribution." Wonder who it was that screwed over Turner so badly that he's now writing only betrayal stories.